Stunning updated home located in the gated community of Westwind in Ridgemoor with pond view. You will immediately notice the great curb appeal with arched windows and brick accents. The carriage lights set on brick columns lead you up the brick walkway to the double steel hurricane doors. As you enter the foyer with 12’ ceilings you will be welcomed in with a wonderful view of the large Dining and Living Room with expansive sliding doors to the lanai and pool area. You will find the Master Bedroom on this side of the home that also offers great views of the pool. The Master Bath has been newly renovated and features a garden tub, Quartz counters, dual sinks, bidet, and a beautifully tiled shower. The other side of the home features a newly remodeled kitchen with Marble counter-tops and a Family Room/Game Room with a wet bar and fireplace. 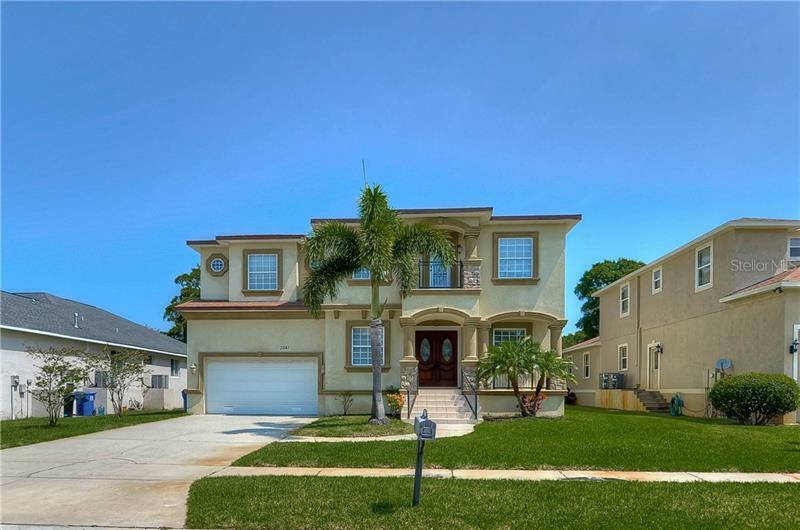 This home offers plenty of space for entertaining and large gatherings! Both guest bathrooms have been remodeled. A pocket door between the Family Room and rear bedroom and bath creates privacy for guests and the bath provides pool access. Other features of the house include whole house surge protection, solar for house/pool, 125 mph EV Impact Windows installed 2016, new/extra electrical panels, instant hot water units for kitchen, bathrooms & laundry, water softener, newer appliances, generator, coded access doors, and steel hurricane doors on the lanai. The 3 stall garage has 14’ ceilings with one stall extended that can fit a 19’ boat. This home is move-in ready!